Biofreeze is a topical analgesic that uses the cooling effect of menthol, a natural pain reliever, to soothe minor muscle and joint pain. It penetrates quickly, offering relief through cold therapy. For this reason, it’s especially effective for use in conjunction with hands-on health care such as chiropractic, massage and physical therapies, and podiatry. When Biofreeze is applied, menthol binds with temperature-sensitive receptors in the skin. Activating these receptors is thought to modulate pain signals through the body’s natural pain relieving systems. This mechanism works similarly to ice, but with additional benefits. Special receptors are responsible for sending pain signals to the brain by way of the spinal cord. When Biofreeze is applied to a painful area, it’s thought to create a cold sensation that overrides these pain signals. 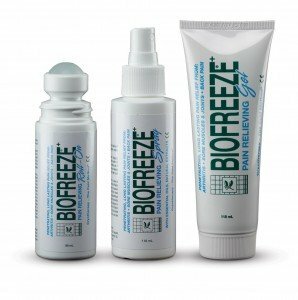 Can BioFreeze Massage Therapy Help Me? Whether it’s an overworked muscle, a chronically achy back or the fitful discomfort of arthritis, pain affects millions of Americans every day. BioFreeze may help you with temporary pain relief. Schedule your massage service today and ask to include BioFreeze.